Lewis Hamilton said he expected a close fight for pole position at the Singapore Grand Prix between McLaren, Red Bull and Ferrari. The McLaren driver was fifth on Friday, but without a mistake on his best lap would have been contesting fastest time with Red Bull's Sebastian Vettel. The German headed McLaren's Jenson Button and Ferrari's Fernando Alonso. 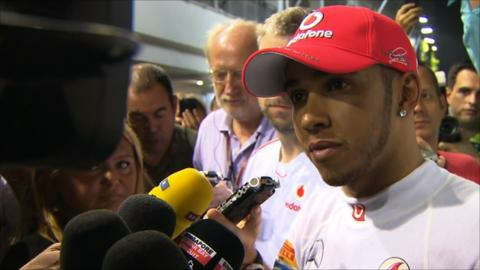 "Jenson's very fast, Fernando also and Sebastian's incredibly quick. We just need to keep working," said Hamilton. Hamilton was exchanging fastest times with Vettel for most of the two 90-minute practice sessions but went into the final two quick right-handers at the demanding Marina Bay Circuit a little too fast on his low-fuel run on the faster 'super-soft' tyres and ran wide. He said: "Not too much [happened] - just ran wide. I lost probably quite a bit over half a second. "I've been quite comfortable with the car, the guys have done a great job and it feels a lot different to the last race when we had a lot less downforce. "It's great to be able to throw the car around a little bit more without it sliding." He said his later race-simulation run "felt pretty poor but I heard it was worse for others so that's comforting." Button was less happy with the behaviour of his McLaren. "[It was] OK," he said. "There's still a lot of work to do. I'm not entirely happy with the balance on the softer of the two tyres. "The lap was not great, had a lot of front locking. We've been playing around trying to find a balance all day really and [we're] still not there. Hopefully we can do that overnight. "We have a few ideas and we think we know how to solve it. "If we get the balance good, we should be competitive around here." Vettel, who ended up 0.311secs quicker than Button, said he was "quite happy" with his car. Alonso was half a second slower than Vettel but his Ferrari looked competitive in race trim - his lap-time average was second only to Hamiton's. But Ferrari's head of race operations Diego Ioverno cautioned against reading too much into the times on Friday. "On Friday it is normally very difficult to understand what is going on, because of [differing] fuel load and track condition," he said. "We have to understand what everyone has to understand, which is the real life of the tyres. "We are still analysing the data, but it seems with one of the two compounds we are not in a bad shape, but I think the major factor will be how long the tyres will last and we will learn it only on Sunday I guess." Pressed on Alonso's apparent ability to run faster laps than his rivals later into the life of the fragile super-soft tyre, Ioverno said: "It is not possible to say now. I think we are not bad on pace but it is too early." Live race coverage on BBC One from 12:10 BST & BBC Radio 5 live from 13:00 BST & live text commentary online from 12:00 BST. Highlights on BBC Three at 19:00 BST.